The followers of Spanish political movement Podemos will decide in a referendum if Pablo Iglesias and Irene Montero remain as general secretary and spokesperson in Congress, respectively, as well as deputies. The two leaders announced on Saturday their intention to submit to general opinion their "credibility", "honesty" and "coherence" with criticism of the elites after the purchase of a villa of more than 600,000 euros. 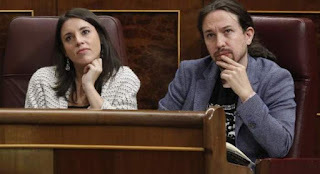 Pablo Iglesias and Irene Montero have reacted to the controversy that has shaken the foundations of Podemos by putting all the positions they hold at the disposal of the party's militancy. A corollary that they assume together. There will be no half measures: they will remain in the responsibilities they perform, or they will present their resignation jointly. "It is up to both of us because the house has been bought by us both," said Iglesias, surprised by the reaction to the purchase of the house. "I am sincere, I did not think that this was going to cause any debate or news of this extent," he has agreed. The secretary of the organization, Pablo Echenique, will detail on Monday the conditions of the consultation to the bases after the meeting that the executive of Podemos has each week. “When someone questions one's credibility, you cannot hide, and you have to face it. It is up to us to decide if we can continue to be worthy to continue in the responsibilities in which we are or make us resign," Iglesias said. The secretary-general endorsed his leadership in Vistalegre II last year with the backing of 89% of the votes and control of 60% of the leadership. "If someone thinks we have something to be ashamed of, it is not up to us to judge. It is the people of Podemos, the registered people, who should value it," Montero has abounded. "Do you think that Pablo Iglesias and Irene Montero should remain at the head of the general secretariat and of the parliamentary spokesperson of Podemos? ", that will be the question that will be asked to the registered voters. The possible answers will be two: "Yes or no." The couple of politicians defended in the headquarters of the party the "coherence" of the purchase of the chalet with the ideology of Podemos, but before the public debate generated they decided to put their future at the controls of the party in the hands of militancy. "We have been doing politics since we were teenagers, we have always said that we are passing through and we have a mandate limit of eight years based on our code of ethics," Montero observed. The publication of the characteristics and conditions of the house - of more than 250 square meters built on a plot of 2,000 square meters with swimming pool and guest house - has aroused much concern in Podemos, and as the week went by the discomfort and the belief that the purchase of the villa could diminish credibility to the speech of the party that, since its foundation, has assumed the representation of the interests and needs of "the people" as opposed to "the caste". It is now in the view of the militancy to decide if the renowned leaders are no longer to be trusted.